The Lion King film cast list has been confirmed… and it includes Beyoncé! Prepare yourself. Disney has released the official cast list for the 2019 remake of The Lion King and, boy, is it good. Late last night (Wednesday 1 November), Disney announced the 14 leading cast members for its adaptation of the Academy Award-winning animation. Donald Glover was previously confirmed as Simba, but now the full cast has been unveiled and it looks like he’ll be joined by one hell of a line-up. 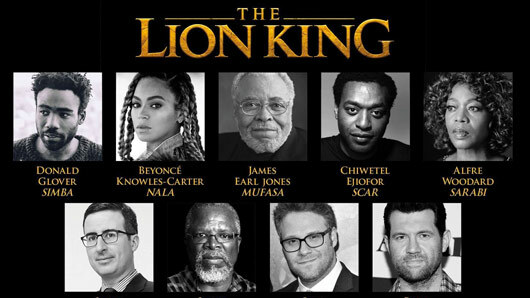 Beyoncé fans will be delighted to hear that their one and only Queen Bey will be starring as Simba’s best friend Nala, while James Earl Jones will take on the role of the mighty Mufasa. Also welcomed to the lion family is Alfre Woodard, as Simba’s mother Sarabi. And we know you’ve all itching to know who will be playing Simba’s evil uncle, Scar… Well, as had been rumoured, the brilliant Chiwetel Ejiofor will be taking on that role, and we’re sure he’ll do a fantastic job. He sure played the villain well in Marvel’s Doctor Strange! Comedians Seth Rogen and Billy Eichner will play the hilarious Pumbaa and Timon, while John Oliver has been confirmed as Zazu. And that’s not all! Emmy nominee Keegan-Michael Key, Eric Andre as Azizi, John Kani, Florence Kasumba also all star in the exciting new, updated film. If that wasn’t enough to get you excited, music legend Hans Zimmer will be returning to add new music to his original 1994 score.